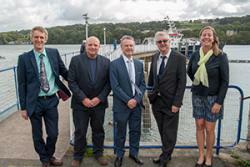 (l-r) Prof Kevin Flynn, Swansea University, Dr Michael Roberts, Marine Centre Wales, Prof Colin Jago, Mark Drakeford and Nicole Esteban, SEACAMS project manager.We delight in the wonderful views and opportunities for leisure provided by Wales’ spectacular coastline. But being surrounded on three sides by water also offers other opportunities- to provide us with a sustainable source of energy, and in the process create employment opportunities. 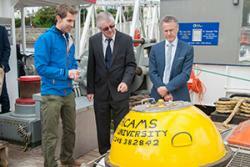 Finance Minister, Mark Drakeford called in to Bangor University today (Thursday 29 September), to receive an update on the start of the second SEACAMS project, managed by the University’s Centre for Applied Marine Sciences along with partners at Swansea University. Tidal energy is the prime source of marine renewable energy for Wales, with industry looking at various forms of energy generation through tidal energy, tidal lagoons and wave energy. The second SEACAMS funding will extend the amount, quality and access to the type of data that development companies need before engaging on the complexities of siting various types of marine renewable energy projects. Mark Drakefod enjoyed a tour of the facilities and met Susan Allender working in a lab.As well as understanding the locations best suited to different types of energy production methods, the developers need an in-depth understanding of how the energy production technologies, whether wave technology, tidal lagoons or any other energy conversion systems, will perform over decades, and how the surrounding environment- the seabed, the water and currents and marine animals will react, as well as any impacts from sea-level change during the long life-times of these energy generators. SEACAMS 2 is set to develop a network of coastal observatories to collect this high-quality data and ensure its availability to potential developers. The work will focus on information gathering around the two established demonstration zones for marine renewable energy already established by the Crown Estate. These lie off the north-west coast of Anglesey and off the Pembrokeshire coasts. SEACAMS will also work with companies investigating the development of large tidal lagoons in both north and south wales. 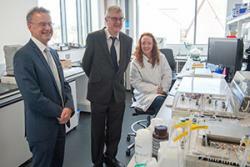 Finance Secretary Mark Drakeford said: “Marine energy is an important sector where Wales has excellent natural resources and can be a world-leader. "SEACAMS2 will continue and expand Swansea University's commitment to supporting the growth of marine and coastal businesses, especially in the marine renewable energy and affiliated sectors, in the convergence area via state-of-the-art collaborative R&D activities with the industry."